Laying the foundation stone of a Kalashnikov manufacturing unit in Amethi, the Lok Sabha constituency of Congress President Rahul Gandhi, Prime Minister Narendra Modi on Sunday said the guns produced in the new facility would be used to fight terrorists and the Naxals , and that the project was the best example of his government’s ‘Sabka Saath, Sabka Vikas (together with all, development for all)’ motto. The prime minister — who landed in Amethi after addressing the pre-poll Sankalp rally in Patna where he slammed the Opposition for doubting the IAF’s strike on a terror camp in Pakistan — accused the Congress-led UPA government of not only delaying the AK-203 rifles’ manufacturing project but also sabotaging the Rafale deal. Thanking Russian President Vladimir Putin for expediting the project, Modi said it would give a new identity to Amethi. The assault rifles would be manufactured at Korwa Ordinance Factory. “The assault rifles manufactured here would help our forces against terrorists and Naxal. In due course, these would also be exported, while generating a large number of jobs for local youth and paving the way for economic development,” he said. “Those who voted for us and those who did not, all are ours...This is the mantra of ‘Sabka Saath, Sabka Vikas." This was Modi’s first visit to Amethi as PM. 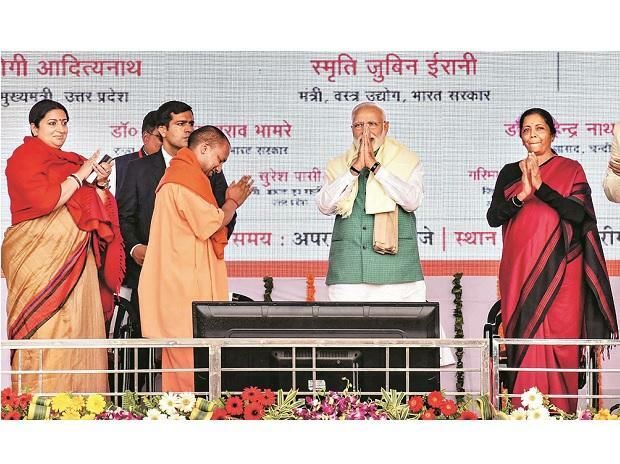 In Patna, he criticised opposition leaders for their scepticism over the surgical strike by the Army post the Uri terror attack, and the air strikes in Balakot after the Pulwama suicide bombing. “Is it appropriate for these parties to speak in a language that suits Pakistan? Leaders of the neighbouring country are using it as a shield to protect themselves against the charge of promoting terrorism. They are clapping gleefully,” the prime minister said. In an apparent attack on Gandhi, who has coined the slogan "chowkidar chor hai (the watchman is the thief)", Modi said, "Those who run their political shops in the name of the poor and care for nothing except for their dynasties, are having problems with the chowkidar. But the chowkidar is alert and on the job."